As seen on the Spud and Chloe Blog – New patterns are now in! 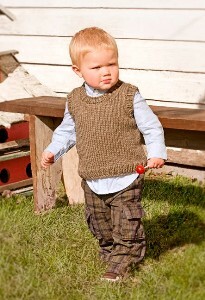 This Li’l Man Vest is extremely cute, and should be a fairly fast and easy knit. Made with only 3 skeins of Outer and on 6.5 needles, you’ll have this knit up in no time at all. Can’t decide which Spud and Chloe yarn to try out first? Why not try them all by making the Three Brrr Bears! 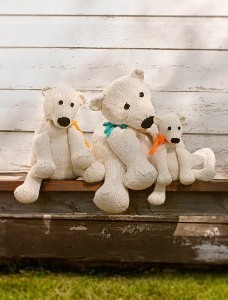 With a few minor adjustments, the pattern is the same for all three bears, but since the yarns are different weights, they all come out in different sizes. Everyone is always looking for poncho patterns for kids. Well I think we’ve found the perfect one now – the Pixie Poncho! With the beautiful fair-isle design, cute hood, and nice bright colours, I can’t see any little girl not liking this! Simple and Classic. The Tea Party Cardi is an every day cardigan made in a simple broken rib pattern. I love three quarter length sleeves, but if you prefer longer, it’s a simple adjustment to make. Tiptoe Cardigan is bright and cheerful. This would be a great cardi to have in the spring time, just as the flowers are blooming. Tiptoe Cardigan is knit in Sweater with a fabric flower applique. If you love putting different colours together, you may want to check out the Sassy Socks - think of all the endless colour combinations! This pattern uses Spud and Chloe Fine (we have all 13 colours!). And congratulations to our Monthly draw winners: Cecilia from Point Grey, and Judi from Edgemont! Please come by to pick up your $50.00 Gift Certificates. This entry was posted on Sunday, January 3rd, 2010 at 4:21 pm	and is filed under Uncategorized. You can follow any responses to this entry through the RSS 2.0 feed. Both comments and pings are currently closed.